Reserve now - we sell out! Come on up to beautiful Shaver Lake where its cooler and the air is clear. Few things in life can rival the thrill of gliding along behind a powerful ski boat on a wake board, inner tube or water skis. Or you can try surfing the wake of a boat! 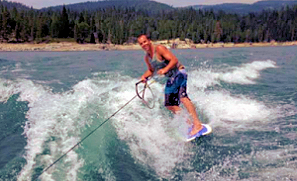 That's why, in addition to pontoon boats, a ski boat and jet ski watercraft for your pleasure, we offer wake boards, a surfboard,inner tubes and water ski accessories. Tubes and wake boards are $25 per day. The surfboard is available for $50 a day. You can rent a 3-5 person tube for $40. All those with reservations must come to Shaver Lake Power Center at 41359 Tollhouse Road, Shaver Lake. We have a strict 24 hour cancellation - or no refund. Please download this Rental Contract Form, print it out, complete it and bring it with you to save you time in the rental process.